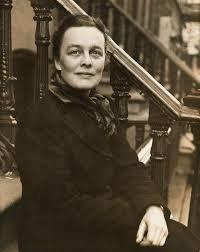 When I was at school, a friend encouraged me to read both the poems and the (three volumes) of autobiography of the poet and Blake scholar, Kathleen Raine. By one of those happenings of synchronicity, I had come to her work simultaneously whilst looking, in my local library, for someone who could help me understand Blake - the poet I was reading so compulsively, haunted yet with little conscious understanding. I had found her collection of essays, 'Blake and the New Age' and had devoured them as they illuminated a landscape from which I have never since retreated. When subsequently I saw, as a student, a copy of Temenos (its second edition), a journal she edited on arts and the imagination, I struck up a four year correspondence that culminated with our first meeting. A prophet is not without honour save in their own country. 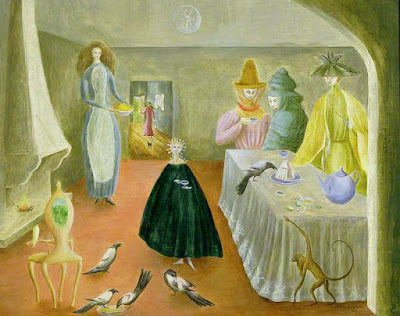 Leonora Carrington as an artist has a journey to go before she is recognised as one of the most significant English artists of the twentieth century. She is significantly resonant not least because she resolutely, as any English eccentric ought, was a determined follower of her own path.